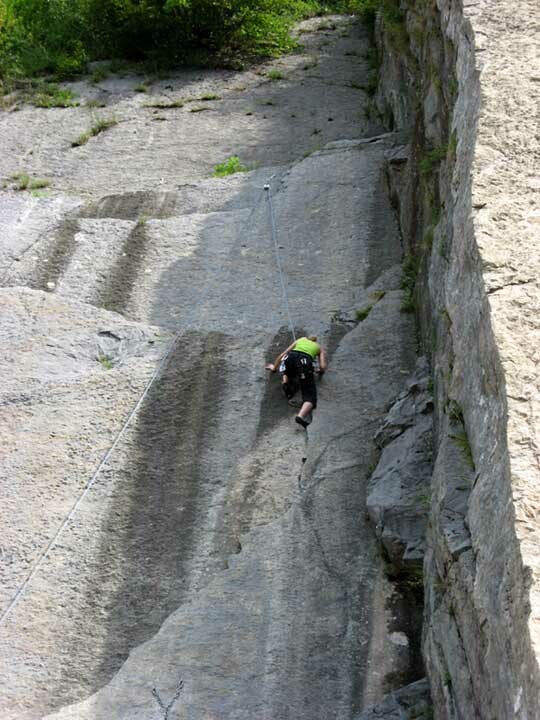 The crag is certainly not one of the most inviting and motivating: it climbs up on smoothed slabs of an old abandoned quarry, a stone's throw from the road, which, due to the historic great attendance, presents, as supports and holds of rounded bumpy slips. However, the charm of this structure remains in those who, repeating the streets will know and appreciate the audacity of the first climbers who, challenging the difficulties, gave rise from this structure to a new way of experiencing climbing and exploring all the walls of the Angel. It is indeed important to remember that all the historical streets have been opened from the bottom with very little or no protection. Some routes, due to today's "soapy" characteristic of the rock on which they rise, have been used by the "Guides" to school iitineraries and currently equipped with artificial sockets. Masone -ATTENZIONE- La falesia è stata schiodata interamente! !